Reverse Raffles have been gaining popularity with some groups for their fundraising events. It starts off as a tradition raffle where patrons purchase tickets. Where things change up is in the drawing of the winning tickets. Tickets are continually drawn until the last one is drawn for the grand prize. If you have more prizes you draw tickets until remaining tickets equal the number of offered prizes. For example, if you sell 100 tickets and have 10 prizes you will draw 90 tickets and then start drawing the last 10 tickets for prizes with the last one being the grand prize. The drawback with reverse raffles is they can take a lot of time if you sell several tickets and your goal is to sell as many tickets as you can. However, the reverse raffle can work well if tickets are drawn throughout or before an event with the final tickets being drawn toward the end for a big finish. This could work well during a sporting event or a longer scheduled event, pulling tickets at each break, halftime or specified intervals. Then at the end of the game or event, the winning tickets are drawn and announced. It is also best if patrons are present to win. It isn’t as much fun if the winners are not there to enjoy the buildup of the final tickets drawn. Another twist on the reverse raffle is to let guests buy back in. This can certainly add more revenue and excitement from your guests. This will inspire a little more of the competitive spirit. Be sure to post or clearly explain the buy back in option in order to encourage more participation and keep everyone happy. For example, you can set intervals to buy back in with the price increasing as the last buy back in chance is offered. We have even seen where final ticket holders negotiate bonus donations between themselves for the grand prize. Patrons will enjoy the interaction and supporting your cause. The pricing of your raffle tickets is determined by a few factors. Your fundraising goal and your expenses for your raffle. Set your goal, number of tickets you expect to sell and you can determine a ticket price to meet that goal. The number and quality of raffle items. The better the gifts the more you can charge for your tickets, but know what your market is willing to pay. The type of event and your audience. You can set higher prices for your raffle tickets for higher end type of events. For example a black tie event can command a higher raffle ticket price than a community fair. The number of tickets being sold. You can set higher raffle ticket prices if you are selling a limited number of raffle tickets versus selling an unlimited amount. 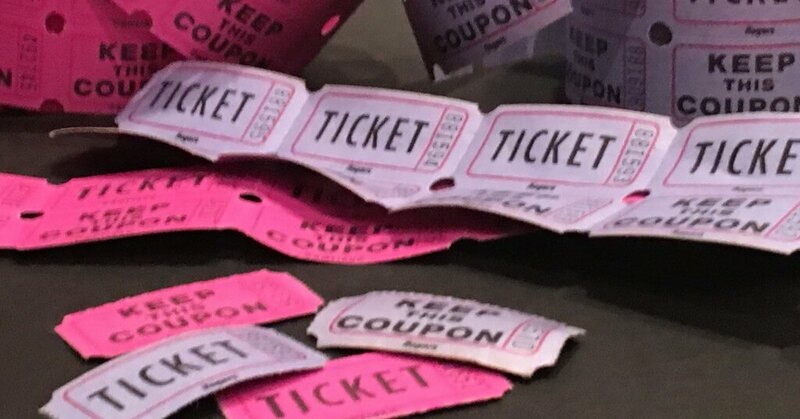 When selling an unlimited amount of raffle tickets, we recommend selling tickets with incremental pricing favoring the guest for increasing their donation and in convenient dollar amounts to eliminate the need for a lot of change. For example, 1 for $5, 3 for $10, 7 for $20 or an arm length for $50 (for higher end events you could start your pricing higher.) Most guests will enjoy receiving a good deal and will up the number they purchase especially when it is for a good cause. In addition to a roll of raffle tickets, raffle box, raffle drum or container to collect ticket stubs, you will need to obtain a few highly desired prizes to raffle. You can reach out to your board, member’s contacts and local businesses to solicit special items that would generate the best interest amongst your supporters. Travel, unique experiences, fine jewelry, special services and one of a kind items are always popular. Use your connections and creativity to secure sought after raffle prizes to insure success for your raffle. Make sure you double-check your state and/or local laws regarding raffles. Each state has its own rules and regulations that you will need to abide and comply with. In most states, you can find these rules with your State Gaming Commission or your State Website. please edit… your “$” is in the wrong place. They got it right. 1 ticket for $5 3 tickets for $10 and so on.